This is hands down the best working dovetail saw I've ever used. What immediately and honestly sets these two saws apart is that Mark Harrell didn't look at what everyone else was doing on the dovetail saw market nor did he open a history book and copy something from a dead wood worker. No sir, low and behold Mark asked people like you and I what we wanted in a dovetail saw and then got down to business and made it. Then he made it again and again until he perfected it. Seriously, I can't find a thing I'd change about them, and let's face it, I can be picky about good design and hand tools.For balls on accuracy, speed and performance, with two sizes available, these are an investment in quality.
. . . I started on some 4/4 cherry, and eventually went to some 5/4 white oak. Again, I put the saw through all the paces Mark and I could come up with, including crosscutting with the rip-filed teeth. The experience was totally different than all my other experiences with a high ppi saw. I started working with it biased to dislike it and in no time it won me over. Mark said he was thinking about nicknaming it "Doc Holiday" as a complement to the larger "Wyatt Earp. No tool can replace good working technique or the hands and eye of a craftsman, and if you’ve read my blog here for any length of time, you’ll know that I do not break down and gush over a tool often, if ever. These are the first tools I have ever come across that I would have to call highly recommended by the Oldwolf Workshop. 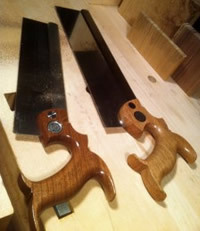 To his credit Mark has created a pair of saws that I’m sure will compete with your favorite dovetail saw and will probably win that competition hands down. Individually or together “Wyatt Earp” and “Doc Holiday” are ready to be your huckleberry. With a 12" sawplate .02 thick and filed 14 ppi rip, it's a great saw that's thin enough for precise dovetail work but stout enough for thicker stock applications. I can't tell you how many times I've needed to cut dovetails in material 1" and up in thickness, and my other saws just wouldn't make the cut. Having the 12" plate also means fewer strokes, and you'll never run the blade out of the kerf while in use (something I've been prone to do in the past with shorter saws). The model I received also has a canted blade which is something I really like for super accurate starting. 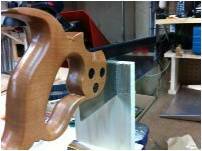 So there it is, something else for the wish list--a 12" hybrid dovetail saw from Bad Axe Tool Works--what are you waiting for? Traditional: Back in the day (well over a century ago), most American sawmakers blued their carbon steel sawbacks, and when matched up with the medium tone of an apple handle and brass fasteners, it was just a great looking saw. You’ll find plenty of them still out there available on eBay today, though the bluing is usually worn off the back. Apple is pretty much the Holy Grail of woods I’m still searching for, but Cherry is a great alternative, with a similar tight grain and lighter tone. So this is the combination Bad Axe started off with: a very traditional mix of cherry, hot-blued (or black pearl nickel-plated) carbon steel, and a brass fastener set that harkens back to an earlier time when communication moved at the speed of a horse. But then I got to playing around with different alloys and wood species—and here’s what I came up with, which have proven to be very popular with Bad Axe customers. If you ever find yourself confronting choice overload when tricking out your Bad Axe saw, then here are some popular mixes for your consideration. Here's a look for those propensed to the dark side of the force. Black Oxided (Hot-Blued) or Black Pearl Nickel-Plated Carbon Steel sawback with a Black Walnut Handle and Black Oxided Fastener Set. Very dark; very bad. I used to call this look by another name (think heavy breathing), but George Lucas would have strung me up. For those of you born on the 4th of July. Stainless sawback matched up with a cherry handle and a niter-blued fastener set. A patriotic, red, white and blue motif that makes you want to snap to attention and salute Old Glory. Another name once applied to this saw as well, but Marvel Comics have joined George’s lynch mob with Captain America leading the charge. Got a redneck streak in you? Do moonshine and Steve Earle lyrics make sense to you? Here's my newest look showcasing the copper back. An absolutely stunning choice when coupled with a walnut or mesquite handle and the hot-blued (black-oxided) fastener set. This mix grabs your attention like a snakebite in the Oklahoma Wichitas. This look finds a home wherever the Union Jack sailed. Any of the wood handle species coupled with a brass sawback and brass split-nuts rocks our English brothers. Henry Disston himself was a transplanted Brit, and though he championed the blued carbon steel backs for the American market, he made sure he offered the same saws with brass backs for his exports to the ancestral homeland. This is the saw all good out-of-the-box-thinking capitalists want, and Dominique would approve. The stainless back and fasteners matched up with a black walnut handle presents a cool, clean look with a dark, ruthless undertone. The medium tones of the mesquite handle also look quite nice in this match-up. Tea Partiers need not apply--you just don't have the gravitas Ayn was writing about. Pure American Southwest. Mesquite handle, Black pearl nickel-plated carbon steel sawback and niter-blued fasteners evoke the tough beauty of the American southwest and the gamblers and gunfighters that inspired countless westerns in the centuries that followed. Now Megan Fitzgerald has opined that this saw should have been called Annie Oakley, and I think that works just fine as well. Frankly, Wyatt is good with any of the alloy/species combinations, because this is more of a saw design moniker for my 12” hybrid dovetail/small tenon saw. What’s the connection? Wyatt’s favorite hogleg was a Colt .44 magnum Buntline Special with a 12” barrel. So when some of my customers asked for a longer dovetail saw, I decided to go all out with a 12” sawback/plate assembly to achieve a longer, more accurate precision cut in fewer strokes. This guy is decked out in my copperhead-killer look, one of my faves.